The Courtyard Marriott Downtown in Fort Wayne, Indiana was the hotel that I stayed in for the conference. The service here was absolutely wonderful. They offered free internet access, which I greatly appreciated, but uploading pictures took awhile. I chose to wait until I was home to share a few pictures. Here are my pictures from FGS 2013. Jim Jackson, Calhoun County Genealogical Society Past President and Me! I agreed to be on the CCGS ballot for Secretary. The last thing I would see as I went to sleep. 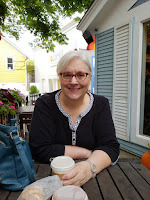 Even though I may not have been bright-eyed at eight in the morning on Saturday, I was awake and in attendance for the first session, Finding Fathers: Bridging the Generation Gap by Elizabeth Shown Mills. The Wayne B room at the Wayne Convention Center had almost a full room for this excellent session. ESM says "to move a line forward or backward, you often have to go sideways." That seemed to be the message throughout the session. I plan to apply it to my ancestor, Huldah Rowley, to prove her parentage. I moved next door to Wayne A in the convention center to hear Robert McLaren present, Using the Internet to Research Scottish Ancestry, kilt and all; not mine, but Mr. McLaren's. He presented numerous online sources and databases to help with Scottish ancestry. I had pre-planned my schedule and this year I decided to include a couple of sessions I wouldn't normally think of taking. One of those sessions was It Takes a Human: Genealogists and Writing by Jeanne Larzalere Bloom. I thought I could use a few techniques to improve my writing skills. This basic writing presentation was broken down in an easy to understand way. I met Kirk for lunch and we walked to Pint and Slice, where I had an excellent calzone. The weather has been wonderful while in Fort Wayne and it felt good to get outside and enjoy some of it. Fort Wayne has been having a busy time this past week. Today, there was a color run and an arts festival in the downtown area. It was nice to see so many people out enjoying all that Fort Wayne has to offer. Dr. Thomas Jones had the tough task of keeping me from an after lunch slump and he did an excellent job with his presentation, Organizing Evidence to Overcome Record Shortages. He used the analogy of putting together a jigsaw puzzle, along with a case study, to help researchers with the identification of their ancestors. I especially liked his suggestions of timelines and tables to visualize the information gathered. I have wanted to explore the world of manuscripts for sometime now, but wasn't sure of the best way to go about it. Laura G. Prescott's session, The Rest of the Story: Using Manuscripts to Create Family History brought me one step closer to achieving that goal. She related writing a family history to building a house. " Build your house with traditional materials. Furnish it with manuscript chic." Ms. Prescott provided manuscript examples that enrich a family history. The conference was coming to a close and I had one more session to go to. I made a last minute change to my schedule and I am glad I did. I ended the day with Paul Milner and English Parish Registers: How to Access, Use and Interpret. I hadn't pre-planned this one because I wasn't sure I was at the point in my English Ancestry research for it. I am so glad I went to Mr. Milner's session. He is an entertaining and informative speaker and a great way to end the conference. This may become a habit as I ended FGS 2011 in Springfield, Illinois with Mr. Milner, too. My husband, Kirk, has been a wonderful genea-buddy this week. He didn't attend the conference, but he did go to a few sessions that were held at the Exhibit Hall. While I was in sessions, he explored Fort Wayne. I felt he needed to be thanked for his support. We went to Mad Anthony Brewing Company for dinner. We were able to relax and reconnect after a long, tiring, but fulfilling week. Fort Wayne, Indiana has been an excellent venue for the conference. The close proximity of the convention hall and the library has been both good and bad. The need/want to fit in as much research as possible collides with the need/want to take full advantage of the conference offerings. I arrived on Tuesday and chose to research Tuesday and Wednesday morning and then give my full attention to the conference. I can't imagine if I had traveled a long distance and wanted to get more research time; what a tough choice that would have been. Five full days of sessions, lunches, social events and research has made this week a success. I am excited to get back to Battle Creek and start using all the resources I learned about this week. Check back for future blog posts about how the conference has aided my research. I knew before I left home that I wouldn't feel like blogging on Friday. Friday was my fullest day. The day started at 8:00 a.m. with Paul Milner. Paul Milner is a delightful way to start your day. His session, "Effective Use of Scotlands People" made we want to jump into my Scottish ancestry. I have heard Paul Milner speak before and he fills his sessions with humor and great research tips. Next, I attended Loretto 'Lou' Szucs, "Finding Ethnic Origins and Naturalization's in the Midwest" session. Lou broke the information down in easy to understand format and filled the presentation with a lot of examples. Friday was the day I had set aside one session to visit the Exhibit Hall. It is less busy during session times and I wanted to make sure I took advantage of all the vendors had to offer. I visited the Media Hub first and posted a few updates to twitter. Then, I went exploring. I spent time looking at books. Even in the digital age, I still love books. I had a couple I was still thinking about and the only thing I ended up buying was a baby bib "I'm the newest sprout on my family tree" for my nephew. For the first time I decided to attend a sponsored luncheon. I chose the Indiana Genealogical Society's (IGS) lunch with Curt Wichter, Director of Allen County Public Library speaking. I am a member of IGS and decided to support the organization. Curt Wichter talked about all the good things that IGS does. These rooms seat about 300-400 each and there were times they were packed. The first afternoon session was by John Philip Colletta, author of They Came in Ships. If you ever get a chance to hear Dr. Colletta speak, you have to go to it. His session, "Passenger Arrival Records, Colonial Times to Mid-20th Century" was filled with humor and great advice for finding those elusive ancestors in passenger arrival records. I enjoyed his talk so much, that I went and purchased his book. Ginger Frere presented the next session on "The Newberry: Chicago's Independent Research Library" I am embarrassed to say that all the times I have been to Chicago, I have not researched at the Newberry. I am going to change that, especially since Ms. Frere introduced me to how much The Newberry has to offer researchers. During this session, the Wayne Convention Center had to be evacuated for a fire alarm. This session was in Hamilton Hall, which is not part of the Convention Center, but in the Hilton Hotel, which is connected to the convention hall. We did not have to evacuate. It was a false alarm and I don't know why the alarm was ringing. My educational part of the day ended with Michael D. Lacopo session, "Methods For Identifying the German Origins of American Immigrants". This was a last minute change. (Gasp! I know I went off my schedule!) I had being hearing all day about what a wonderful speaker he was and decided to go see what his take was on German Immigrants. I had heard Dr. Lacopo speak at FGS 2011, so I knew I couldn't go wrong with this session. The last session on Friday was the one that was giving me fits, anyway. I could have been happy going to six of the eight sessions. One would think after a day filled like mine, I would head back to the hotel to unwind. No, I still had one more thing to do. After a quick stop at King Gyro's, Kirk and I headed to the Allen County Public Library's Evening at the Library. Family Search sponsored "Journey through the Generations with Our Veterans. Donations were accepted and the total raised for the Preserve the Pension fund was $92,000. The evening started with a presentation about the War of 1812, the awarding of an 1812 Quilt, and a dessert buffet-which they said had a limit of five desserts. You should have seen the desserts, huge brownies and cookies, breads, muffins, and tarts. Five was very generous and I felt a little piggy taking two. They were delicious. Other participants stayed to listen to, or dance to, music. The library was open until midnight for researchers, but I was too tired. I headed back to the hotel and Kirk went to a Fort Wayne Tin Caps baseball game. The stadium is adjacent to the Marriott Courtyard hotel we were staying in. I figured I would be asleep as soon as my head hit the pillow, but a rock band had other plans for me. The outdoor gardens to the Botanical Conservatory was hosting a concert which could be heard very clearly from my hotel room. The band was actually very good so it wasn't a bad way to end a very long day. Hallway of the Wayne Convention Center leading to the Harrison Rooms. Wayne Convention Center was a great place to have a conference. Thusday marked the opening of the educational sessions of FGS 2013. The morning was kicked off with the keynote speaker, Richard Aquila, who took conference goer's through the roots of rock and roll. I have a small confession to make, I didn't make it to the keynote session. I guess Wednesday nights activities caught up with me. I was able to get my Roots Magic questions answered by Root Magic expert, Bruce Buzbee. Renewed my membership to NEHGS . Bought a book, The German Research Companion, which I have been wanting. Talked to vendors and society organizations. Attended the society showcase, lots of great door prizes were awarded. While at the society showcase I ran into the past president of my local society, Calhoun County Genealogical Society. He mentioned they still needed help on the board. The two openings were Vice President and Secretary. I have been looking to become more involved with my local society and agreed to be on the September ballot for Secretary. I wasn't ready to jump into the Vice President's roll. Ran into a retired teacher at the elementary school my children attended, Miss Brenneman. Kirk and Miss Brenneman worked at the same school and they caught up on how each of them were doing. Thomas W. Jones-Planning and Executing Efficient and Effective Research: A Case Study: As usual Dr. Jones presented an excellent session. The Wayne B room was experiencing technical difficulties and he handled it with professionalism and a little humor. I would not have been as patient. Nevertheless, he was able to convey the information to the audience. The room was packed with a few hundred genealogists proving how popular Dr. Jones is. Elizabeth Shown Mills-Smiths and Joneses: Success with Families of Common Names: This was my first time hearing Elizabeth Shown Mills speak. Again, the room was packed. She presented an information packed session with four research models and two case studies. Railroads Across America replaced Railroad Trilogy: The Tracks, The Train, The People. Patricia Walls Stamm presented an interesting talk on the history of railroading in America with resources for researching ancestors employed in the railroad industry. Harold Henderson-First Steps in Indiana Research: Harold took participants through the resources available for Indiana research, including online and on sight research repositories. Harold provided numerous sources for Indiana researchers. If you haven't heard the 2014 FGS Conference will be held in San Antonio, Texas. The 2015 conference was announced and FGS will be partnering with Roots Tech and hold the FGS 2015 conference in Salt Lake City, in February 2015. It will be interesting to see how this plays out. It has potential to be a great collaboration. FGS 2013 is proving to be an excellent conference. My schedule today is packed. It starts at 8:00 am and continues straight through until 9:30 tonight. Midnight if I want to take advantage of the late night ACPL Genealogy Center late research hours! Check back for more updates. I started Wednesday at one of the best places on earth for a genealogist, the Allen County Public Library Genealogy Center. I stepped out of the car as the nine o'clock church bells were ringing. I had my research plans in order and was ready to go. My main focus for the morning was to figure out how to use Amish and Amish Mennonite Genealogies by Hugh Gingerich. I have many family names in that book. I read the how to use this book and started checking the family names. The nice thing about this book is that the author provides many sources for his documentation. I will still need to verify the information with primary sources, but what a list of primary sources I have now. I was so engrossed in my research that I didn't make it to the first afternoon conference session I had planned on attending. Lots of people wanting to research their family history, it was great to see. The Genealogy Center set up extra tables between the two rooms for researchers. The Genealogy Center was prepared for the influx of people this week. The staff and volunteers were incredible. People were shelving books as fast as they were being returned to the carts. Others were helping with computers, copy cards and machines, general, and research, questions. They all were ready and willing to help, it was absolutely fantastic. Thank you. I was able to make it to two conference sessions, after a quick lunch. Both sessions had to do with volunteer recruitment. Reaching Out Online: How to Grow Your Society Through Social Media by Devin Ashby and Courtney Connolly was an overview of the various social media forms and how one can use them to help their society grow. The presenters stressed the importance of understanding your purpose for doing social media. "Don't do it because everyone else is". Asking yourself why you want to do it and what is your goal will help clarify a social media strategy that works. Examples of great social media content was shared as well as content ideas for societies. The Shape of the 21st Century Genealogical Society by George G. Morgan was a look at how societies need to "adopt new strategies and adapt to today's trends." New technologies, programs and methods are needed to keep existing members and attract new ones. The session ended with examples of best practices and methods for effecting change. Next, my husband and I attended the Opening Social which was held at the Foellinger-Freisman Botanical Conservatory. The question of the day for Kirk was "If he was into genealogy?" His answer was anything from "I am here to carry the books" to "A little, but not like my wife is" The Conservatory is absolutely gorgeous. Entertainment, light refreshments, cash bar, door prizes and socializing provided a great end to the day and a great kick off to the next three days of conferencing. One of many beautiful gardens. Kirk having a little fun! I have arrived in Fort Wayne and already been treated to a great dinner, courtesy of Family Search. Family Search invited all bloggers, who were going to FGS 2013, to a blogger dinner at the Grand Wayne Convention Center I didn't count how many bloggers were in attendance, but I would guess at least 50. After a little social time, welcoming statements, and a delicious dinner the bloggers were treated to the latest news and what is happening at Family Search. The next year will be another one of great growth for Family Search. Diane Loosle is the new Family History Library Director. Diane has a warm and welcoming demeanor and I am sure she will be great in this position. "Not charts...but Hearts" and "Heart Turning Experiences" will be one of the focuses as Family Search goes forward. 1.7 million names are added to Family Seach daily. Wow! Family Search will be introducing Family History Discovery Centers. These interactive centers will be opening up this year in high traffic areas with hopes of going worldwide, eventually. Oral History Recording Studio's will be placed in Family History Centers in the future. Adding photo's and stories to Family Search Family Tree will be expanded on. Third party apps and partnerships will continue to be developed. 1 Billion names have been indexed since 2006. For every one name indexed there are ten names that go un-indexed. Volunteers are needed to continue with this worthwhile project. A new marketing campaign video centered around indexing can be found on You Tube. The video is Family Search: Indexing is Vital for Research. I am sure I missed a few of the new and exciting things happening with Family Search, stay tuned to see what develops in the next year. Previously, I wrote about the gift of pictures I received from my cousin, Kathryn. The pictures below, my Aunt Lola was able to identify as Alma Fredrick and Joey Prantle. Alma Fredrick was the daughter of J. August Fredrick and Louise Zastrow Fredrick. She was born in Manistee county, Michigan on 28 February 1893. She married Joseph Prantle and they had two sons, Joseph and Robert E. Alma Prantle died 2 May 1932 in E. Grand Rapids, Kent, Michigan. Joseph and Alma's son, Robert E. was born 26 August 1932 and died seven days later on 3 May 1932. Alma died one day before her infant son did. Although, I haven't looked at her death certificate, I would guess she died due to complications with child birth. How sad, she was only 39. Her son, Joseph 'Joey' went to live with his Uncle John Bruce and Aunt Mary (Fredrick) Bruce sometime after his mother's death. Alma Fredrick Prantle and son, Joseph, circa 1931. Previously, I mentioned how fortunate I was that my cousin, Kathryn, shared pictures that she had in her possession with me. After I had scanned them, she told me I could keep them. How wonderful! None of the pictures were labeled. I set about trying to identify who was in the pictures. My mom, Aunt Lola, and a few cousins helped me to identify the pictures. They did a great job and only four are not identified. Those are below. If you recognize anyone in the pictures, please leave me a message in the comment area. I would greatly appreciate it. The photographer was Guther in Washington, Iowa. Guther Photography was in Washington, Iowa from 1941-1960. Washington, Iowa was the home of Nina (Graf) and Thomas Johnson, who had two sons. Could it be one of Nina's granddaughters? She had two born in the 1940's. Is anyone good at dating photos? There are no clues on this picture. No one had a clue who it could be. Again, no clues available. Could this women be the same as the one in the picture above? I guess it is time for me to study how to identify pictures. I think there are clues with the hairstyles and clothing that would help me identify a time period of the pictures. All in all I think we did a good job of identification. There were 19 pictures total and only four we need to identify. I would love to hear what you think about the pictures and the time period they were taken in. Please leave a comment. This year, for the first time, the Fredricks' Family Reunion had a Pie Baking Contest. 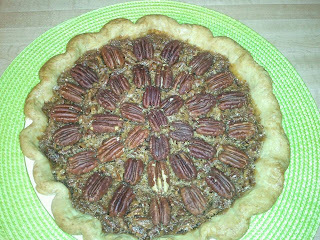 My entry for Bourbon Pecan Pie was chosen as the winner. It must have been the bourbon that did it. I think there were about 10 pies that were entered. I wish I had written them all down. I remember the following pies: custard, lemon meringue, pecan, french apple, apple squares, cherry, Grandma Daisy's Orange?, and others. People who brought pies signed in by name and kind of pie. Cousin Cheryl cut one piece from each pie to be judged. Five judges tasted the pies and decided on a winner. The rest of the pies were placed on the dessert table for others to enjoy. Toast the pecans by placing pecans on a baking sheet in a 350 degree oven for a few minutes. Watch closely to prevent burning. Reserve the nicest halves for the topping. In medium saucepan, combine the butter, brown sugar, corn syrup and salt. Bring to a boil over medium heat, and stirring constantly, continue to boil for 1 minute. Remove from the heat and stir in the nuts, bourbon, and the vanilla. Set the mixture aside to cool slightly, about 5 minutes. Whisk the beaten eggs into the filling until smooth. Put the baked pie shell on a sheet pan and pour the filling into the hot crust. 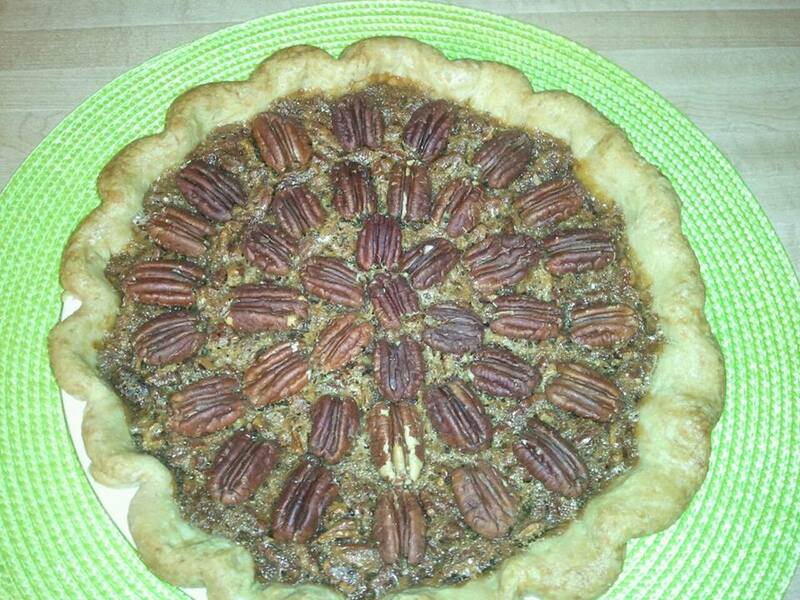 Arrange pecan halves, decoratively, on the top of the pie. Bake on the lower oven rack until the edges are set but the center is still slightly loose, about 40-45 minutes. If the edges get very dark, cover them with aluminum foil half way during baking. Cool on a rack. Note: A blind baked pie crust is a single pie crust that has been baked without any filling. I put a piece of parchment paper in the pie crust and then dried beans to hold the shape of the crust. Pie weights or pie chains can be used in place of the beans. The annual Fredricks family reunion was held in July and I have yet to blog about it. The past three weeks have been busy in our household. A trip to Chicago for the Newberry Library Sale and visiting with my favorite daughter; my sister, her daughter and her grandson visited; my hubby had a few doctor's appointment and a mild breast bone cartilage problem; house and garden projects and a few other things have kept me busy. My husband, Kirk, and I left on Friday morning. We picked my parents up at their home in Portage, Michigan. We made it to Wellston, Michigan and were able to check in at the cabin we were renting for the night. The next trip was to the Dublin General Store to order a fruit platter for the family reunion. This store is amazing. If you like jerky and homemade sausage, this is the place to go. It is in the middle of nowhere, but was a fully stocked grocery store. The next stop on our reunion weekend was to Brethren, Michigan for lunch at Traks Bar and Grill. This is a great place to eat, and one of the few restaurants in Brethren. It use to be Casey's Bar, which I had frequented a few times in my young adult life. My mom and I left Kirk and my dad at the bar and went across the street to the Brethren Cemetery, where a lot of my relatives are buried. My mom and I wanted to visit her sister's, Kathryn 'Kate', grave site. The sprinklers were on and we thought we were a safe distance from them, but no we got sprinkled with water. Luckily, it didn't get my mom's hair wet! I have been to this cemetery a few times, so I showed my mom her parents and Graf grandparents graves, after I turned the water off. Our next stop was to the Family Centennial farm. My cousin, Rosie, owns it now and I had made arrangements to stop by to visit. Rosie's daughter, Connie, was there as well. Another cousin, Nancy, traveled from California to go to the reunion and she was staying with Rosie. I don't think I had ever met Nancy, so it was nice to meet her and spend time getting to know her. We spent a few hours talking, looking at pictures, and hearing family stories. I really enjoyed this part of my weekend. While we there Canadian cousins, Mari and Ernie, stopped by. Mari's grandmother, Emma Fredrick, lived on the family farm at one time. Next, we drove to Kaleva to kill a little time before dinner. We went by a home that my aunt once lived in, that might have been a mistake as it looks terrible. You couldn't even see the front door it was so overgrown. We ended up back in Brethren and ate at Trak's, again. The food is good! While we were eating Rosie, Connie, and Nancy came in and we pulled tables together and had more fun talking. The night before the reunion has become known as the 'cousins' party. It is held at the cottage of my Uncle John and Aunt Louise's. This was my first year for attending the cousins' party. My parents, Kirk and I arrive and I get my chair set up, and my cousin, Kathryn, hands me a pile of pictures. I think the family is realizing how much I love old family pictures. Luckily, I had my flip pal scanner in the car and I start scanning. As I was scanning, my mom and cousins were looking through the pictures and trying to identify the people in them. They knew a few, but I was left with more unidentified than identified. No worries, though, as I was going to see Aunt Lola the next day and she has a terrific memory. I get the pictures scanned and I hand them back to my cousin and she says, "You can keep them". That was music to my ears. Thank you, Kathryn! The next day, Saturday, was the day of the reunion. The Fredricks Family reunion is held the second Saturday of July, every year, at the Park in Brethren, Michigan. The park is just down the street from where my grandparents lived. My Aunt Kate and Uncle Carl lived next door to them. At one time, Aunt Kate and Uncle Carl had a store and gas pumps in the front of their house. It is now a pizza place, which I would not recommend eating at. Kirk and I stopped there last year to see what it was like and it was nothing like when my aunt and uncle lived there. The reunion is the highlight of the weekend, for me. I don't know what the final head count was, but there were more people there than I remember in a long time. The first part of the reunion is for getting to know people. I spent the time talking with Aunt Lola, I had brought pictures for her to look at. Plus, I had all the ones given to me the night before. Aunt Lola is 92 years young and her memory is better than mine. She was able to answer all my questions and identified all but four of the pictures. Amazing! I especially enjoyed her reaction when she would be in a picture. As she identified people in the pictures, I asked her what she remembered about the person. I tried to write as much as I could down, but I would like to spend an afternoon with Aunt Lola and find out more. Aunt Lola identifying pictures for me. The rest of the afternoon was spent eating, visiting, having a white elephant auction, a talent show (no, I did not participate!) and for the first time, a pie baking contest, which I did participate in. More on the pie baking contest, tomorrow. This year, I have accumulated and scanned a lot of family pictures. I put them all on a flash drive. I took my laptop and plugged my flash drive in to share the pictures, via a slide show, at the reunion. Luckily, there was electricity and I could leave the slide show going and people could view it at their leisure. There was even a discussion on who it was in a picture and not every one agreed! We were trying to figure out how many years it has been since we started having the family reunion at the park. It has been at least 26 years. Before that the reunions were held at the family farm or at Aunt Kate's. I remember going to the family reunion as a young child. There were years when my children were busy with activities that we didn't go, but I am glad that I have been able to go the past few years. It is one of my favorite summertime activities. Grilling the brats and dogs, chicken was cooked also. Since I haven't figured out a way to clone myself, I have spent the last couple of days narrowing my conference sessions down. I have selected my first choice in 15 of the 16 Thursday, Friday, and Saturday time slots. I saved one time slot to visit the exhibit hall, when it is less crowded. It wasn't easy finding a time slot to give up for the exhibit hall, but I did it. 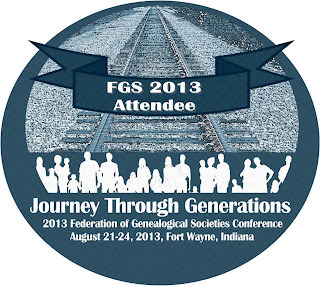 Journey through Generations is the Federation of Genealogical Societies' annual conference being held in Fort Wayne, Indiana August 21-24th. If you haven't registered yet, you still have until Wednesday, August 14th to do so online. Registrations will be accepted at the conference. The advantage to pre-registering is that you get access to the online syllabus. Trust me, you will be glad you could look it over ahead of time. It is filled over 150 great syllabi. The selection of sessions is excellent. This year, after I made my first choices, I decided to see how many different tracks I was using. There are 18 tracks for Thursday-Saturday, I selected sessions from eight of those tracks: Methodologies, Transportation, Midwestern and Neighboring States, Midwest Repositories, Migration/Immigration, Online Resources, British Isles, and Writing, Speaking, and Publishing. I am heavy in the methodology track with six selections. The other tracks have one or two selections from them. There are 16 different methodology sessions to make your selections from. Most other tracks have four to six choices, except for Records which has 16; Technology has 12 and Midwest Repositories has 10. I think the selection committee did a great job of providing a variety of choices. I like to make a second choice for each session, just in case my first choice is filled to capacity when I arrive. I selected sessions from the tracks I didn't pick with my first choice classes. My second choices come from the Records, Ethnic, Genetics, Midwest Religious Communities, Technology and Military Tracks. What tracks didn't I selection a class from? I didn't select European, NARA/Federal, German or African American tracks. The European track had four choices, I had attended one before, and the other three did not pertain to my area of research. The NARA/Federal had four, but I didn't feel they would further my research goals at this time. The German track would help me in my research, but I had taken a four hour workshop in German Research at the FGS conference in Springfield and decided to explore other areas of education this time. Lastly, I thought about taking an African American track session because it is an area of research I know nothing about, but I had a hard enough time narrowing my choices and this track didn't make the list this year. Overall, I am very happy with my choices, but you know what they say about the best laid plans. I will try to remain flexible. I know it seems a little OCD to analyze my selections to this degree, but when sleep evades one at 2 o'clock in the morning, what else is there to do? I am a Federation of Genealogical Societies (FGS) Ambassador. My role as an ambassador is to help promote the FGS 2013 conference through blogging and other social media platforms. I have not received any compensation for promoting the conference. FGS 2013 and Fort Wayne Indiana Here I Come! It has been two years since I attended my very first FGS conference. I look back on that experience fondly. Once I heard the 2013 conference was going to be held in Fort Wayne, I put it on my schedule. Fort Wayne is a quick jaunt down I-69 for me and I wasn't going to miss a national conference being this close to me. I am in the process of preparing for the conference that is 10 days away. I have selected most of my class sessions, printed the syllabus for the classes I chose, and updated my google calendar. I was thinking about what else I needed to do to be ready to go the the conference. I am a list maker from way back and preparing for this conference will be no different. After attending the keynote speaker, 16 sessions. one workshop, and one dinner-would I do anything different? Just a couple of things. First, I think I would look at the total day before signing up for special events. Pairing a four hour session with a dinner after, might have been better planned on my part. I hope I was decent company at dinner. The other thing I would do differently would be to spend the last night at the hotel. I decided to leave after the conference and drive to Chicago (through six construction zones!) and spend the night with my daughter. I loved visiting my daughter, but an extra night to unwind after the conference would have been helpful. And, lastly, take more pictures. I was so wrapped up in the conference I didn't take enough pictures. How am I doing so far? I forgot to look at the total day. Friday will be my longest day, I plan to attend morning and afternoon sessions, attend the IGS luncheon, and attend the Friday evening event. I may decide to skip the last Friday session to get ready for the evening event. I just want to get the most out of going. I will let you know how it goes. If I don't blog on Friday, you will know why. I made hotel reservations for Saturday night, this time, which will be good. The only other thing I have to remember is to take more pictures. My husband got a nice camera for Father's Day and I plan to use it this time. I feel more confident about going this time as I will not be a conference goer newbie. Are you going to Fort Wayne? See you there. If you would like to read my blog posts from Springfield, Illinois, click here. Where in the World is Louise Fredrike Zastrow Fredrich? One of the first place family historians search for their ancestors is in the United States Census records. I am compiling my census information in a table format. Each month I share a Where in the World post. This month I am sharing my great grandmother, Louise Zastrow Fredrich. Louise Zastrow married Johann August Fredrich in 1875. Her name can be found in the census as Fredrich, Fredrick, and Frederick. Where in the World is Louise Zastrow? My great uncle and aunt, Harry and Maggie (Graf) Klingelsmith, suffered the death of their only son in 1923. A death record can be found on Family Search for their child. No name was given to the infant male that was born 30 May 1923 and died the same day in Dickson, Manistee, Michigan, United States. Dickson is Dickson Township, which the community of Brethren is a part of. Harry and Maggie Klingelsmith lived in Brethren, Michigan most of their lives. Harry and Maggie are buried in Brethren Cemetery, in Brethren. I do not know where Baby Boy Klingelsmith is buried. The information for Baby Boy Klingelsmith is from an index. My next research step is to find the actual death certificate. Source: "Michigan, Death Certificates, 1921-1952," index, FamilySearch (https://familysearch.org/pal:/MM9.1.1/KFQQ-7ZS : accessed 07 Aug 2013), Harry Leroy Klingensmith in entry for , 1923. 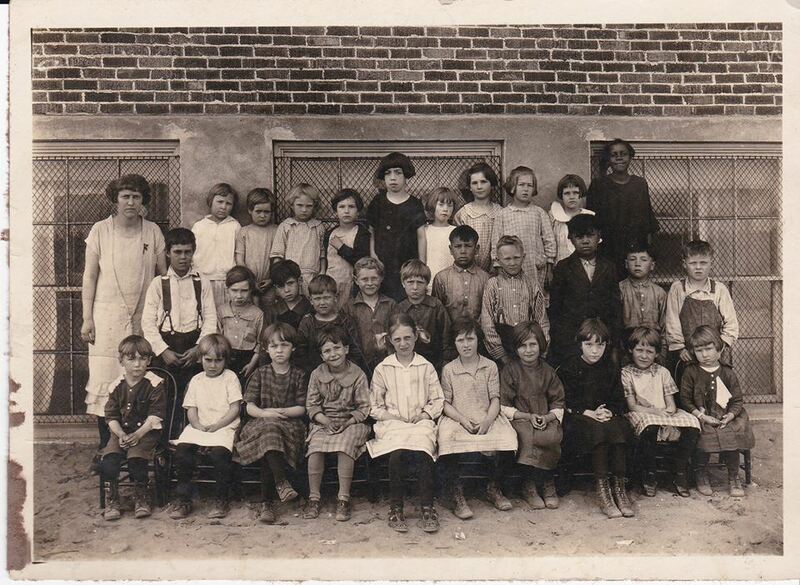 This picture was taken during the 1925/1926 School Year at Dickson School in Brethren, Michigan. Two of my aunts are in the picture. Lola Mae Fredricks is in the top row, second from the left and Kathryn Louise Fredricks is in the front row, second from the right. Both daughters of Otto and Daisy (Graf) Fredricks. Aunt Lola was in Kindergarten and Aunt Kate was in second grade at the time. The teacher on the left was Miss Anderson, Aunt Lola's kindergarten teacher. Another relative, Lloyd Tritten, can be found in the middle row, sixth from the left. Lloyd Tritten is the son of William and Mary Ann (Graf) Tritten. My grandmother, Daisy Graf Fredricks and Mary Ann Graf Tritten were sisters. Dickson School is located at the corner of High Bridge Road and Coates Highway. It is the school that my mother attended. Sadly, it is in need of repair. A group of alumni are trying to raise money to make the building a cultural center. One of the Dickson School alumni is James Earl Jones, the actor and voice of Darth Vader. He has helped to raise money for the school. The class picture was taken outside of the school. You can see the basement windows and brick, much as it was in 1925.